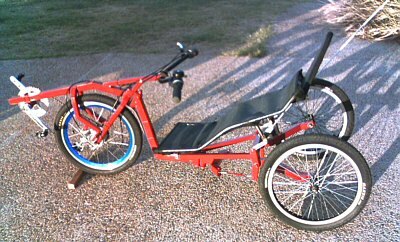 This is a rear wheel drive tilting tadpole trike. It featues Prince swing arms at the front, with trapeziums to keep the kingpins vertical. The swing arms are perpendicular to each other, on the camber/caster plane. The idea is that the rider controls the tilt, and the front wheels are free-to-caster. The tilt, causes the front wheels to turn to the desired heading. The trapezium geometry provides a weight bias to the inside front wheel which provides low speed maneuverability. Jetrike is a front wheel drive tilting delta trike. It features Prince swing arms with self centering geometry that ensures the outside wheel moves down further than the inside wheel moves up. This raises the seat height as it tilts, providing a small centering force. You have to applaud the simplicity and elegance of the Python lowracer. It features a light frame and a simple moving BB chainline. Rick Wianecki contected me about building a FWD tilting delta trike like Jetrike, only using a twist chain drivetrain. I am really keen to seeing how it turns out. Rick has considerable recumbent bike building experience, and his earlier Tilting Trike will be familiar to anyone who has scoured the web looking for tilting trike info. Lately he has been busy constructing his Frank-n-Liner -- a LWB carbon fiber monocoque streamliner -- for the HPRA races. Rick's plans have progressed through several iterations. His design brief was to have a high seat, and a narrow track for city traffic and commmuting. Despite several simulations I have been unable to come up with geometry that satisfies both. However I have come up with a new approach, the Jetrike MkIII.